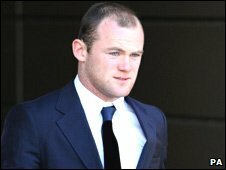 Wayne Rooney has told a packed courtroom that his agent helped to make him a "very wealthy young man". The Manchester United and England striker, who is being sued over a contract dispute, appeared at Manchester Mercantile Court. Sports firm Proactive says it is entitled to £4.3m commission payments. Throughout Rooney defended his agent, Paul Stretford, who is also being sued after he quit Proactive in 2008, taking Rooney and his wife Coleen with him. Rooney said he "trusted" Mr Stretford, who was found guilty of a number of misconduct charges and banned from the FA in 2008, and was grateful for his help and management. The court heard the young football prodigy, then aged 17, was signed up by Stretford in 2002 as he burst on to the football world with his home-town club Everton. If Wayne Rooney glanced left as he sat down to give his evidence he'd have seen through the court window the white metal structure which supports the stands at Old Trafford, two miles away. That's the place where, every week, his feet do the talking - where he is in his element. Inside the courtroom, he was a fish out of water. He looked and sounded uncomfortable as his financial affairs were dissected. If he loses this case Wayne Rooney stands to pay commission thought to be more than £4m. Judging by the rows of expensively tailored pinstriped suits - either suing or defending him - the legal costs alone would be enough to bankrupt most people. His barrister, clearly jumpy at the packed press gallery listening, kept butting in to prevent questions which could lead the striker to reveal his earnings. Mr Stretford, a founder and director of the sports management firm Proactive, brokered multimillion-pound deals for Rooney with firms including Nike and Coca Cola. He also acted for Rooney's wife Coleen, whose celebrity career took off as the player established himself as an England regular following his transfer to Manchester United in 2004. 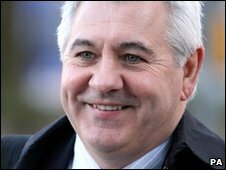 The deals agreed to pay Proactive 20% commission but, since Mr Stretford left the firm in acrimonious circumstances in October 2008 no further commission payments have been made. Proactive's lawyers claim that, under the terms of the contract Stretford signed with the Rooneys while he was working for the firm, Proactive is still due the payments. Rooney, 24, agreed when asked by Ian Mill QC, acting for Proactive, if Mr Stretford had helped to make him a "very wealthy young man". The footballer also agreed he sided with Stretford after his agent was dismissed from his job, charged with misconduct and banned as acting as a football agent by the Football Association. Mr Mill asked Rooney again what "commercial assistance" his agent gave him after he parted company with Proactive. "My football career and football stuff has to come first," Rooney said. The striker told the hearing he wanted Mr Stretford involved in discussion with Manchester United about renewing his playing contract, which expires in 2012. Rooney said he did not believe Proactive could take care of him after Mr Stretford left. Mr Mill said the only reason Proactive was not able to provide services for Rooney was because the star did not want it to. "As I said before, I wanted Mr Stretford to look after me," said the striker. "Before Mr Stretford was basically sacked from the company, nobody explained he was going to be sacked and that they could still do things for me." Counsel and the judge needed to know how much the Croxteth-born player earns in total - but the figure could not be disclosed to the press and public. Rooney produced a piece of paper from his jacket and passed it to Mr Mill who looked at it before passing it on to Judge Brendan Hegarty QC. The "vast majority" of his earnings were from his contract with Manchester United, said Mr Mill. But a sizeable proportion comes from the four sponsorship deals he has with Coca-Cola, Nike, EA Sports and the new addition of Tiger Beer. Rooney's mother Jeanette said she and her husband Wayne snr only ever sought the best for their son. "I didn't understand contracts and I still don't understand contracts," she added.